The Oxygen Evolving System of Photosynthesis documents the proceedings of an international symposium entitled ""Photosynthetic Water Oxidation and Photosystem II Photochemistry,"" held at The Institute of Physical and Chemical Research (RIKEN), Wako, Saitama, Japan, 15-17 March 1983. Several other papers from authorities in this field are also included. 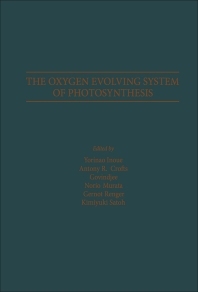 This book provides in a systematic fashion the most current thoughts and insights into the field of photosynthetic oxygen evolution. The volume contains 46 chapters organized into five parts. Part I deals with the subunit structure of photosystem II reaction center pigment proteins and the charge separation (generation of positive and negative charges, P680+ and Pheo-). Part II examines the components and their function on the donor side. Part III discusses the biochemistry of the water oxidation enzyme system, polypeptide composition, and functional reconstitution. Part IV take up the functions of chloride and bicarbonate in electron transport and the mechanism of photoactivation in latent or Tris-inactivated chloroplasts. Part V discusses the fate of reducing equivalents going through the two-electron gate mechanism, together with the biochemistry of the quinone components on the acceptor side.